According to experts, now is the best time to be a first-time buyer in the UK. Numerous support programmes from the Government, including cuts to stamp duty, as well as well lower deposit and cheap mortgage deals, the number of people buying a home for the first-time is on the rise. According to UK Finance (the trade body for Britain’s banks), an astounding 365,000 buyers bought their first home in 2017 – an impressive increase of 7.4% on 2016 and the highest since the financial crisis in 2007/08. In other words, around 1,000 people bought their first-home last year every day. This sudden rise was most likely assisted by the introduction of stamp duty cuts in the chancellor's November budget, which is expected to save four out of five first-time buyers up to £5,000 in cash, as well as Government schemes, such as ‘Help to Buy’. According to real estate company Savills, the popular ‘Help to Buy’ scheme helped almost 40,000 first-time buyers across England access home ownership in the year to March 2017 last year; accounting for around one in five new homes. How much can first-time buyers expect to pay? Per a report from Halifax, Sellhousefast.uk analysed the average price for a typical first-time buyer home in England and Wales and found that the average first-time buyer will pay £212,079 in the UK, and in England and Wales the average price is £200,166, slightly less. 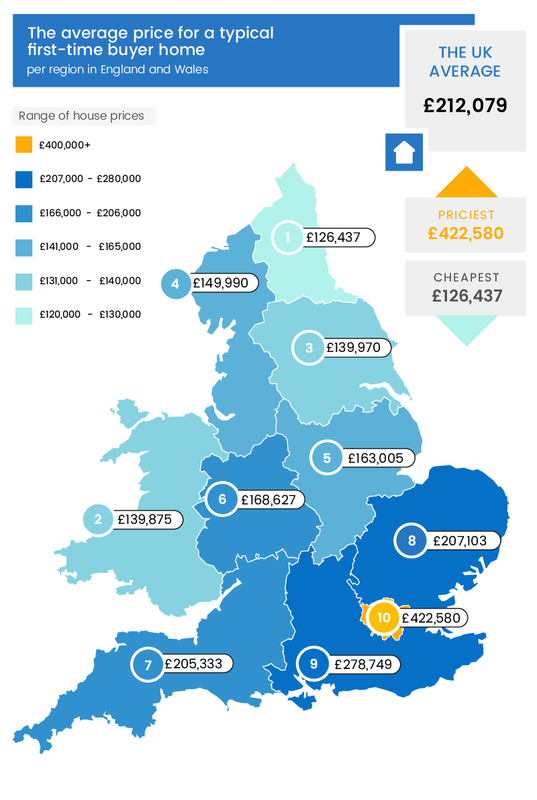 The North East has the cheapest average price, at just £126,437 for a first-time home, in front of Wales who pay £139,875 – a staggering £13,438 difference. A first-time property in Yorkshire and the Humber is priced closely behind Wales at £139,970, followed by the North West at £149,990. The average first-time buyer home in the East Midlands costs around £163,005, followed by the West Midlands at £168,627. The South West surpasses the £200,000 mark, costing first-time buyers £205,333 – a staggering £36,706 more than the West Midlands. The South West is closely trailed by £207,103 by East Anglia, and the South East of England soars to £278,749. However, perhaps unsurprisingly, Greater London is the most expensive region to purchase a first-time home, setting you back a staggering £422,580 – £ 296,143 more than the cheapest region, Northern Ireland. As well as investigating the regions where homes are most and least affordable for first-time buyers, Sellhousefast.uk also identified what the next generation and young people think about the property market today, utilising a report from Halifax. Sellhousefast.uk unearthed some interesting results, such as a concerning one in ten 18 to 21-year-olds think stamp duty is money to pay for stamps! In addition to this, they found that more than a quarter (27%) of 18 to 21-year-olds believe they will be homeowners by the time they reach 25. 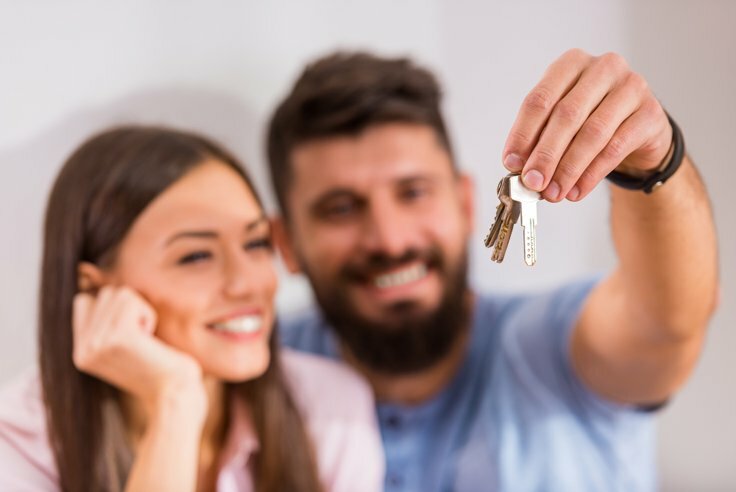 However, in reality, over the last 40 years, the average age of first-time buyers across England and Wales has been on the rise, according to Savills. The average first-time buyer has increased from 27 in 1977 to 30 today, and in London, the average is even higher at 31 years old. Further to this, a quarter of 15 to 17-year-olds expect to save for 20 years for a deposit for their first home, and almost a quarter (23%) of 18 to 21-year-old men believe a deposit of between £5,000 and £10,000 would be enough to help secure a home, compared to just 5% of women. Sellhousefast.uk found from a Savills report that the average deposit paid for a first home was £1,094 in 1977, £2,200 in 1997 and £25,867 last year – an increase of 2264% from 1977 – emphasising that it is incredibly difficult for first-time buyers to get on the property ladder. Surprisingly, one in five 11 to 21-year-olds in London think they can purchase a home for as little as £50,000, and a maximum of £200,000, however, Sellhousefast.uk research found that the average first-time buyer house price in London is more than double the top end, at a whopping £422,580. “As the next generation begins to consider flying the nest and become homeowners for the first time, it can feel incredibly daunting. With the excruciating house prices and deposits needed to buy a home in today’s market, for many, buying a home and stepping foot on the property ladder feels impossible.